Synopsis : The Intel-created advanced communications platform can be adapted for 3 million people afflicted with motor neuron diseases and quadriplegia. Intel demonstrated for the first time with Professor Stephen Hawking a new Intel-created communications platform to replace his decades-old system, dramatically improving his ability to communicate with the world. The customizable platform will be available to research and technology communities by January of next year. By studying the acute needs of Hawking, and the very specific relationship between this man and his machine, Intel has delivered a tailored solution - called ACAT (Assistive Context Aware Toolkit) - that results in improved communication for Hawking with the world. It has the potential to become the backbone of a modern, customizable system other researchers and technologists can use to benefit those who have motor neuron diseases (MND) and quadriplegia. Hawking has an MND related to amyotrophic lateral sclerosis (ALS), a condition that has progressed over the years. He is almost entirely paralyzed and communicates through technology. "Medicine has not been able to cure me, so I rely on technology to help me communicate and live," said Hawking. "Intel has been supporting me for almost 20 years, allowing me to do what I love every day. The development of this system has the potential to improve the lives of disabled people around the world and is leading the way in terms of human interaction and the ability to overcome communication boundaries that once stood in the way." 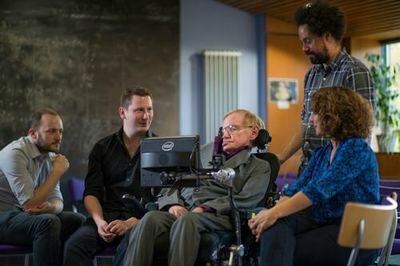 A multidisciplinary team of researchers from Intel Labs has been working for three years with Hawking to replace his current communications system with modern technology. Hawking was instrumental in the design process, providing ongoing feedback, to help Intel improve the system with every iteration. "Professor Hawking uniquely used technology to master communicating with the world for decades, but his old system could be likened to trying to use today's modern apps and websites with a computer without a keyboard or mouse," said Wen-Hann Wang, Intel vice president and Intel Labs managing director. "Together we've delivered a holistically better communication experience that contributes to his continued independence and can help open the door to increased independence for others." Similar to the parts of an engine interacting smoothly to run a car, the Intel-created software user interface enables existing and new technologies to efficiently work with each other. The result: Hawking's typing speed is twice as fast, and there is a 10x improvement in common tasks, such as easier, more accurate and faster browsing, editing, managing and navigating the Web, emails and documents; opening a new document; and saving, editing and switching between tasks. This information is sent to his existing speech synthesizer so he can communicate to others through his Lenovo laptop running Microsoft Windows*. For example, to conduct a Web search, Hawking previously had to take arduous routes, such as exiting from his communication window, navigating a mouse to run the browser, navigating the mouse again to the search bar, and finally typing the search text. The new system automates all of these steps for a seamless and swift process. MND impacts voluntary muscle activities, like speaking, walking, swallowing and general movement of the body. Progressive in nature, it causes increasing disability and eventually death. Lama Nachman of Intel Labs joined Hawking onstage in London to outline how their work together can inspire the research community. "Technology for the disabled is often a proving ground for the technology of the future," said Nachman. "From communications to genetic research, technology is beginning to open doors to possibilities that can only be imagined." The new toolkit created by Intel can be customized and changed to suit different users. The Intel-created system is a modern software interface for researchers and technologists to create customized solutions enabled by touch, eye blinks, eyebrow movements or other user inputs for communication. With the platform being accessible and free, Intel and Hawking envision that research and technology communities - such as those focused on sensing, text prediction, context awareness and user interface design - will build upon and bring new and improved solutions to market. *News Release by Intel: Disabled World makes no warranties or representations in connection therewith. PR content may be edited for style, clarity, and/or length. If you are connected with this page and want it corrected/updated please contact us.